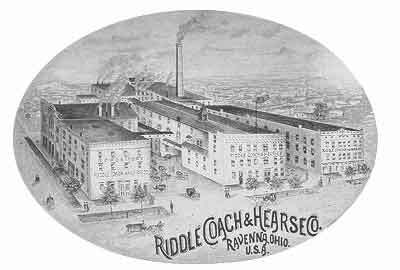 The history of the Ravenna, Ohio coachbuilding firm of Merts & Riddle, and its descendents, Riddle Coach and Hearse Co., and the Riddle Manufacturing Co., can be traced back to 1831 with the establishment of the Clark Bros. Carriage Company. Newell D. Clark (sometimes spelled Newel) was born in Tallmadge, Summit Co., Ohio on December 14, 1814 to Ephraim and Ala Clark, who had moved to Ohio from their native Massachusetts in 1802. After an education on the family farm, Newell was apprenticed to a local wagonmaker and in 1831 joined his three brothers, James A., Allen I. and Miletus S. Clark, in a carriage and buggy manufactory in Ravenna, Portage County, Ohio. Newell had a knack for management and accounting, and within a few short years had taken over management of the firm doing business as N.D. Clark & Co. In the course of commerce he became associated with the old Portage County Branch Bank, which was merged into the First National Bank of Ravenna in 1863. In 1861, he sold his carriage and buggy manufacturing business to two employees, Charles M. Merts and H.W. Riddle, and devoted all of his efforts to banking. When the bank’s president, John L. Ranney, passed away, Newell was elected its president, a post he held between 1867 and his death in 1885. Newell D. Clark’s main claim to fame is his association with the term gold-bricking. In October of 1879, Clark was visiting one of his mines in Leadville, Colorado when a group of miners headed by Peter Lavin, approached him asking for a $10,000 cash advance on a 50 lb. brick of gold that had not yet been shipped. Clark accepted the offer providing that one of the miners accompany him to Chicago in order to verify that the brick was indeed solid gold. The money was handed over, and the miner departed, however, on further analysis it was discovered that while the sides and corners of the brick were solid gold, the main body of the brick was not. The unfortunate event made the headlines and soon afterwards other miners tried the nefarious scheme and thereafter the phrase "to sell someone a gold brick" came to describe a swindle and to "gold brick" someone meant to defraud them. Henry Warner Riddle was born in Allegheny City, Pennsylvania (suburb of Pittsburgh), on February 8th, 1838 to Hugh and Elizabeth (Thornburg) Riddle. He lost his mother at an early age, and while his father worked at various construction sites around Pittsburgh young Henry sold newspapers, ran errands, delivered mail, and worked as an Ohio River cabin boy. In April of 1853 Henry was apprenticed to John South, a well-known Pittsburgh coach-builder. During Riddle’s tenure at John South, the Allegheny City coachbuilder received an award for “Best Buggy” at the 1853 Pennsylvania State Fair. After the completion of his 3-year apprenticeship, he worked as a journeyman in South’s Allegheny City shop. In 1856 he embarked on a river trip to New Orleans, stopping off for brief stays in Memphis, Vicksburg, Natchez and Crescent City in order to finance his journey south. Upon his return trip, he stopped off in St. Louis, Cincinnati and Dayton spending as much time as needed in order to pay his way. He settled in Florence, Kentucky, where he dabbled in wholesale carriage sales, purchasing Pittsburgh-built vehicles and reselling them to dealers in Cincinnati, Ohio and Covington, Kentucky. While working for John South, Riddle had worked alongside a talented woodworker and toolmaker named Charles M. Merts, and the two had become close friends. During Riddle’s tour of the country, Merts had relocated to Ravenna, Ohio were he pursued his craft with that city’s largest builder, the Clark Brothers. Coincidentally, Merts and Riddle were also brothers-in-law as Merts had married one of Riddle’s sisters before moving to Ohio. By that time the two eldest Clark brothers had passed away (James A. Clark died in 1852) and the firm’s president, Newell D. Clark, had become involved with the Portage County Branch Bank and wanted to sell the business. Charles M. Merts suggested that Clark contact Henry Riddle who at that time was working in Cincinnati, Ohio. Although Riddle thought his business prospects were better in Cincinnati, he agreed to purchase Clark’s assets and property in partnership with Charles M. Merts for $42,000. Clark agreed to hold a note for the partners and Merts stayed in Ravenna to run the factory while Riddle represented the firm on the road. By that time Ravenna was linked by rail to most of the cities in the Midwest, and soon afterwards Merts & Riddle’s coaches became commonplace in the major cities of the mid-west including Chicago, Cincinnati, Cleveland and Pittsburgh. Merts & Riddle debuted at the start of the War Between the States, and although their workforce was greatly reduced, they survived that dark period building wagons and other wood products for the Union Army. They were frequent exhibitors at the Ohio State Fair and in 1863 were awarded best two-horse family carriage, best trotting wagon, and best display of carriages and buggies. E.C. Reed of the Reed & Curtis Carriage Company (est. 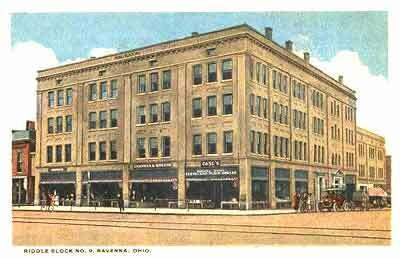 1868) of Piqua, Ohio, learned the trade with Merts & Riddle. At the end of hostilities in 1865 the firm resumed production as well as their position as one of the largest manufacturers of buggies and carriages in the state. Riddle also got married to Emily H. Robinson, the daughter of George Robinson, Chief Engineer and Superintendent of the Cleveland & Mahoning Railroad and president of the Second National Bank of Ravenna. 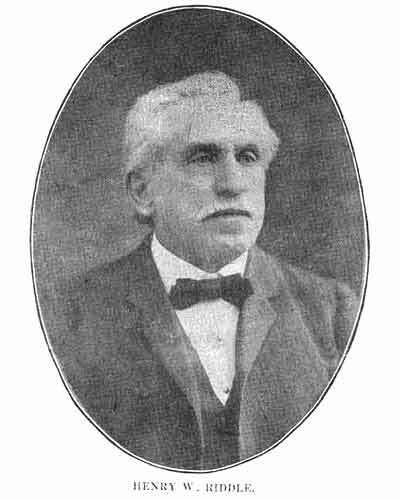 George Robinson would later serve as Ravenna’s Mayor and was also the father of Judge E.F. Robinson, a prominent Ravenna attorney and probate adjudicator. The following day representatives from Warren, Ohio visited the partners, hoping to entice them to relocate to their city, going as far as offering a $5,000 signing bonus. 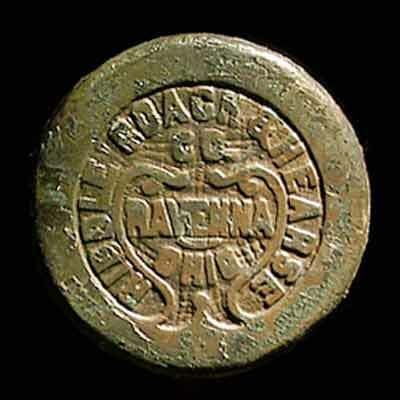 However, both partners wished to remain in Ravenna, and thanks to two local banks they were given an 8% loan of $55,000 on their name and reputation alone. A dedication party was held on the 10th of November, and by the 1st of December the first of their twin 5-story brick structures were ready for occupancy. 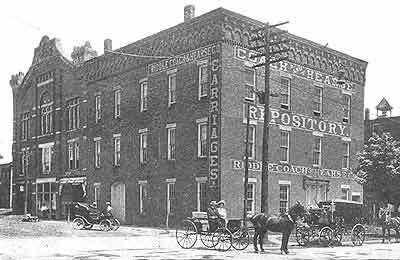 The First and Second National Banks of Ravenna were now well represented on Merts & Riddle’s board of directors and the Merts & Riddle factory grew to occupy an entire block of East Main St. between Walnut & Elm Sts. Charles M. Merts’ brother William joined the firm in the 1870s as did Henry W. Riddle’s brother, James T. Riddle, (J.T. Riddle) the firm’s bookkeeper. Adolph E. Herman, the noted carriage designer, worked for the firm during the early 1880s. “Received by Nelson Greenland to Take the Place of the Hearse. On Christmas Night 1888, a large fire destroyed 7 small wooden structures located near the firm’s East Main St. factory. Riddle purchased the burn-out buildings and constructed a 3-story brick building which was the first of eleven commercial structures he would eventually erect along Ravenna’s Main St. Today, the “Riddle Block” is on the National Register of Historic Places. 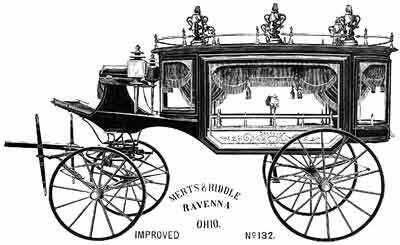 As the decade wore on, funeral coaches became the focus of the firm, and when Charles M. Merts retired in 1891, the firm was reorganized as the Riddle Coach and Hearse Company. A San Antonio sales office and ware room was established in the late 1890s by L.P. Ball, Riddle’s southern U.S. sales representative. A little known fact is that many of the larger coachbuilders of the late nineteenth and early twentieth century owned or leased freight cars that were used to transfer raw materials and finished carriages in and out of their busy plants. The more successful the firm, the more rails cars they owned, and if we use that as a guide, Riddle was quite successful as a turn of the century roster of rolling stock lists Riddle Coach & Hearse Co.’s freight cars, numbered from 2 to 26. 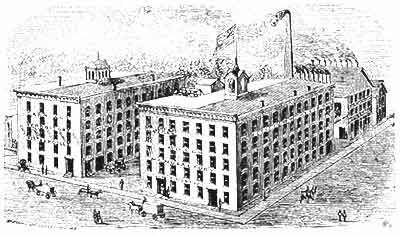 At some point prior to the turn of the century, the firm’s twin 5-story structures built in 1871-1872 were rebuilt as pictures of the firm dating from the late 1890s clearly show a trio of three-story brick structures. President William McKinley had the distinction of riding in three vehicles produced by three different American coachbuilders in the final days of his life. A special Brunn Carriage Mfg. 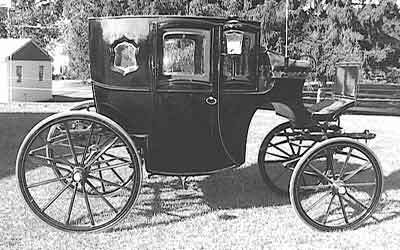 Co. built and designed landau carriage painted a dark maroon with a shiny black landau leather top and upholstered in rich maroon broadcloth was used by the President during his September 1901 visit to Buffalo, New York. On September 6 the President left the John G. Milburn residence where the President and Mrs. McKinley were guests and rode in the Brunn landau to the Pan American Exposition grounds. Later that day anarchist Leon Czolgosz mortally wounded the head of state while the President was standing in a receiving line at the Exposition’s Temple of Music. 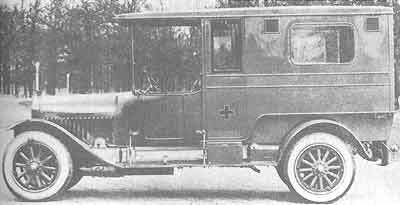 The electric ambulance that carried the mortally wounded President from the Pan American Exposition’s Temple of Music to the Exposition’s Hospital was built by F.R. Wood, of New York City. Whether it was the reported gangrene or a lethal build-up of body fluid as currently thought, McKinley died at the Milburn home 8 days later, on September 14, 1901. 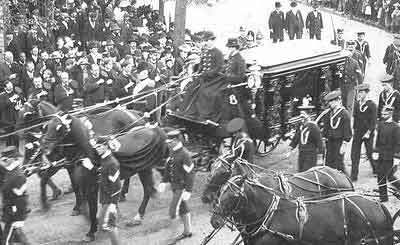 The President rode in a horse-drawn Riddle hearse during the Canton, Ohio leg of his funeral procession. McKinley also rode in a number of other hearses during the week following his passing, but the builders of those vehicles remain unrecorded. “Destroyed By Fire at Ravenna Sunday, Entailing a Loss of a Quarter of a Million Dollars. “Ravenna, O., June 29 – Fire almost completely destroyed the great plant of the Riddle Coach and Hearse Company here Sunday causing a loss of $250,000. There is only $18,000 insurance. “The fire was the largest in the history of this town and the flames were confined to the one block only by the hardest fighting. “The White Hospital is only a few doors away, and a panic was created among the patients. “The Riddle company manufactures funeral cars, coaches and carriages. One hundred and fifty vehicles were in the course of construction and all were consumed. “Several firemen were badly burned about the hands and head and some painfully injured. “Riddle Block No. 4, occupied by a dry good firm, several families and in which several turnouts were stored, were nearly totally destroyed. “One hundred and fifty skilled men were thrown out of work. Luckily for Riddle, both of Ravenna’s banks held shares in the firm, so money to rebuild the plant was readily available. By 1910 Riddle had relinquished day-to-day control of the factory to his two sons, Henry Warner Riddle Jr., and Maxwell Forman Riddle. Charles G. Bentley (b.1867), a local banker, was listed as the firm’s vice-president and Riddle’s son-in-law, Frederick Pallsgraff, and nephew were also involved in the enterprise. A large fire destroyed one of H.W. Riddle’s 11 “Riddle Block” structures on March 15, 1911 creating a minor $6,000 loss. Luckily the fire was confined to the immediate vicinity of the Empire Block, several blocks away from Riddle Coach & Hearse’s East Main St. factory, which suffered a loss of approximately $75,000. With the advent of the motor industry Riddle added a line of bodies especially designed for the White light truck chassis which was built in Cleveland, Ohio just 38 miles northeast of Ravenna. The first White-Riddle coaches appeared around 1912 and during the teens many of Riddle’s coach bodies were sold through the well-established White sales organization. 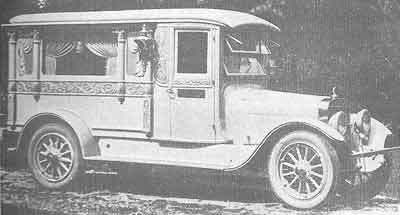 A White-Riddle combination hearse/ambulance made its first appearance in 1913 closely followed by a dedicated ambulance. The July 26, 1913 issue of the Newark Advocate (Newark, Ohio) provided some free publicity for the White-Riddle motor ambulance, which, according to the article, could run for a mile on electric power! “Criss Brothers, undertakers have placed an order with the Riddle Coach and Hearse Company of Ravenna for a modern motor ambulance. The vehicle will be installed for use here as soon as the builders are able to complete the car. “This ambulance is the last word in motor-ambulance construction. The chassis of the White Automobile Company is used for the foundation of the car, while the Riddle people build and equip the bed. The engine is of fifty horse power and is electrically equipped throughout, a feature being the storage battery by which the machine can be run for a mile in case the gasoline motor should fail. “The interior is finished in solid mahogany and is fully furnished with all conveniences for physicians and surgeons with a view of aiding them in emergency cases. “The car will be delivered in sixty to ninety days." “Finest Auto Invalid Carriage in the County. “Has just been installed by Friday & Thomas. 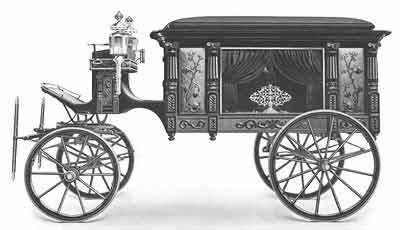 It is a combination of hearse and invalid carriage, with a full Limousine front and has a very pleasing body design, being ornamented just enough, with hand carving, to relieve the plainness and still not be overdone. “The finish is beautiful silver gray, with solid gold striping. The interior of the car is veneered with genuine mahogany. An adjustable invalid bed is included, one that may be taken up and down the average stairs. In fact it is a Chair-Cot for which every invalid carriage owner has been looking. The body and chassis are all from one firm. 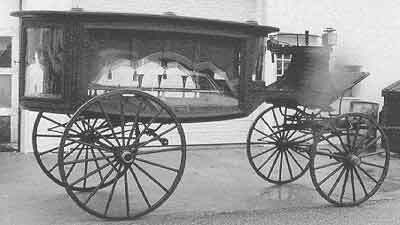 The chassis is the Riddle Coach & Hearse Company’s of Ravenna, Ohio; 6 cylinder, 45 horsepower. This motor has been in service three months and during that time it has proven itself able to travel the worst roads in the country. “Mr. Friday will arrive here this afternoon with this new invalid carriage, accompanied by Mr. Thompson, a representative of the Riddle Coach and Hearse Co.
During the teens carved-panel funeral coaches were Riddle’s primary product although the combination ambulance-hearse, a funeral car easily converted for ambulance use, were becoming popular with funeral homes interested in additional sources of revenue. At that time, dedicated ambulance services were in their infancy and the costly vehicles were primarily purchased by large hospitals and municipalities, not funeral directors, who remained Riddle’s main customers. 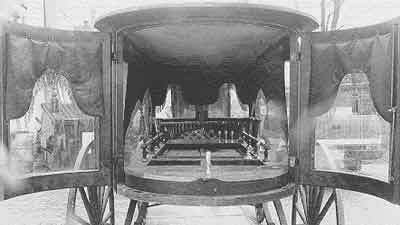 As late as 1920, Riddle continued to mount huge coach lamps on their carved-panel hearses whose styling also dated from the late nineteenth century. 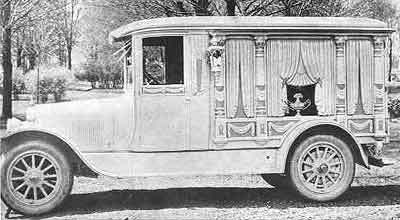 No longer exclusively black, Riddle’s motorized funeral coaches were also available in light gray as well as a very popular two-tone gray and white scheme that highlighted the intricate carved draperies. The poor health of the firm’s founder and president prompted a 1919 reorganization of the firm which was now became the Riddle Manufacturing Company. When Riddle finally passed away on December 16th, 1920, Charles G. Bentley, Riddle’s current vice-president, was put in charge of the firm, and Henry Warner Riddle II (b.1880-d.1962) was elected chairman. By that time H.W. Riddle Jr. had become involved in local politics and was twice elected mayor of Ravenna and even ran for the Ohio State Senate in 1930. As president of the Second National Bank of Ravenna, a major Riddle stockholder, Charles G. Bentley, was heavily invested in the firm, both historically - Second National was the very same bank that Henry Warner Riddle Sr.’s father-in-law, George Robinson, had founded a half century earlier – and financially. Riddle’s first passenger-cars became available on special order starting in 1919 although they didn’t appear in the catalog until 1921. 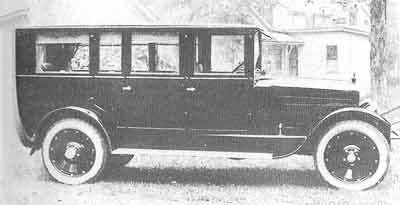 The Riddle 7-passenger sedan and limousine closely resembled a Cadillac and included a painted radiator which differentiated them from Riddle’s other vehicles which were equipped with nickel-plated units. 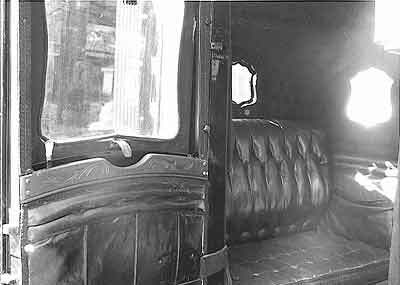 A special feature of the Riddle Sedan and Limousine was their extra-wide two-piece side doors which were built without a center pillar on the passenger side, allowing easy entry and exit for wheelchairs, ambulance cots and caskets. Period advertising stated the new "Double Side Door Convertible Seven Passenger Sedan" was designed specifically for the "public and private service of the funeral director, his family or patrons." Prices for the vehicles ran from $4,850 for the seven-passenger sedan to $5,500 for the nine-passenger limousine. 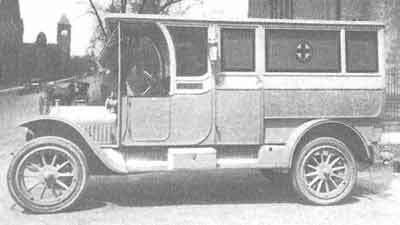 Also available was a $4,850 eight-passenger glass-partitioned limousine that could be ordered without the partition as a side-loading ambulance. Motor's January, 1923 show number reported that Riddle had built 90 closed cars during 1922. Charles G. Bentley stated that the firm’s 100 employees were poised to double that number during the present year. During that year Riddle’s limousines and limousine-style coaches became available with optional nickel-plated Tuarc disc wheels in place of the standard wooden artillery wheels. 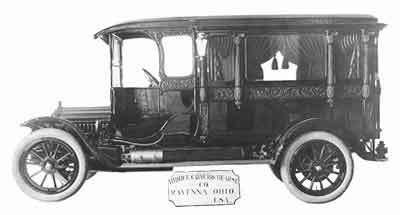 A 1923 Riddle carved-panel funeral coach was used for the funeral of President Warren G. Harding, a former resident of Marion, Ohio who died in office on August 2, 1923. Riddle loaned the vehicle to the H. Schaffner Co., the President’s Marion-based funeral directors. 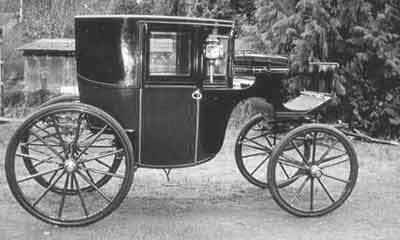 After the much-publicized event, the coach was purchased by the Mungovan & Sons Co., of Fort Wayne, Indiana. Between 1923 and 1925 Continental 6-cylinder 6T and 9A engines were available on the Riddle assembled chassis which was priced at $2,800 for a bare chassis. 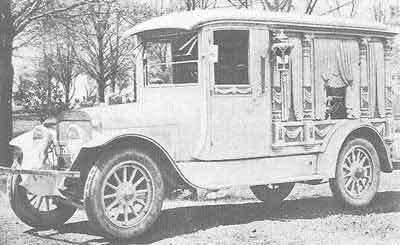 When equipped with coachwork, prices ranged from $4,350 for a straight hearse, $4,500 for a casket wagon to $4,600 for a carved panel hearse. 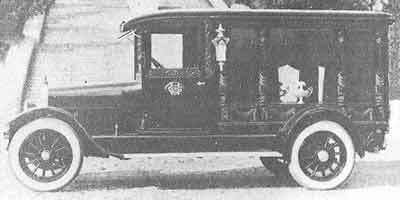 Their new $5,500 limousine-style hearse debuted in the 1924 catalog as did a dedicated ambulance which was priced at $5,850. All Riddle coaches were now available with nickel-plated disc wheels and whitewall tires. By the mid twenties many old-world hearse builders had been forced out of business due to their reluctance to invest in the costly dies and heavy presses needed to produce the new metal-clad coaches emerging from new competitors. The 1926 death of Charles G. Bentley’s son, H.R. Bentley, in front of the factory, accelerated the firm’s demise. At the next board meeting the Riddle’s officers recommended that the firm withdraw from business while it was still solvent, and the family-controlled board of directors agreed. Riddle’s saleable assets were auctioned and the various buildings that made up the firm’s East Main St. factory were either sold off or redeveloped into office space. In 1998 Roy Rogers, the beloved western singer and actor, took his final ride in a white horse-drawn Riddle Hearse.